I have developed an FET impedance converter for use with the Fishman pickup on my Kay orchestra bass. As shown in the schematic below, the circuit is divided into two sections, so that the input section can be mounted inside the head shell of a 1/4" plug. This puts the active circuitry right were it counts, on the instrument. Two isolated output circuits are shown, but you can have more. The prototype I use in performance has three outputs: 1/4" phone, RCA phono, and XLR. For the XLR output, I used a TRW/UTC #O-2 mic-line transformer, inside a #O-17 magnetic shield, to get even lower output impedance. For an improved version of this circuit with better headroom and reduced harmonic distortion, see my Active Plug Bootstrap page. For applications where battery power isn't required, I've also developed a Vacuum Tube Direct Interface, using triaxial cable to connect to the instrument. 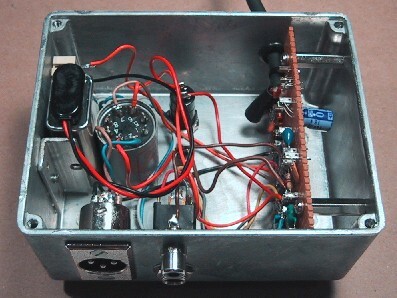 The circuit is optimized for low current drain with a single 9 Volt power supply. Distortion is 1% or less up to 1 Volt RMS output. Gain is set at unity, which makes the circuit very stable with transient inputs, and matches up well with most instrument and sound reinforcement amplifier inputs. With no equalization provided, frequency response is flat allowing the circuit to be used with almost any instrument. Equalization, if needed, can be done on the mixing board or instrument amplifier. Here are some snapshots of the JFET input circuit mounted on a Switchcraft SilentPlug 1/4" phone plug, and of the battery box with additional circuitry and mic-line transformer. Magnetic pickups, consisting of many turns of fine copper wire wrapped around a permanent magnet, are found on almost all solid body electric guitars and basses. They are highly inductive, and require an impedance conversion before being connected to line level circuits. The conversion may be done by onboard active circuitry which effectively isolates the impedance of the pickups from the harmful effects of potentiometer resistance and cable capacitance. Or it may be done in an outboard preamp or instrument amplifier, allowing potentiometer resistance and cable capacitance to absorb high frequency components of the signal. Use of an Active Plug impedance converter will overcome cable capacitance, but can't help losses due to potentiometers inside your instrument. Piezo pickups, consisting of pressure sensitive ceramic elements clipped to the bridge or other portion of the instrument where vibrations can be sensed, are commonly used on hollow body guitars and classical instruments. They are primarily capacitive, and also require an impedance conversion before connection to line level circuits. Most preamps and instrument amplifiers don't have a high enough input impedance to manage these devices, which typically require a load of not less than 5 megOhms. Cable capacitance reduces all components of the signal, while load resistance cuts out low frequencies. Most applications therefore must have either onboard active electronics, or a special high impedance direct box, like the Active Plug described above. There is a special kind of piezo transducer you should be aware of, which is a ceramic microphone mounted inside certain instruments like accordians. These installations were mainly done in an era well before solid state amplifiers were available, and relied on the typically high input impedance of tube amps and preamps for good sound. If you plug one of these instruments into a modern sound mixing board, it will sound raspy or tinny. A high impedance direct box can make a big difference in this application. K & K Sound, A manufacturer of musical instrument electronics. Fishman Transducers, Manufacturer of the pickup piezo pickup I use on my upright bass. Gollihur's Bass Site, An extensive collection of bass links. Kay Basses, A clearinghouse for information about the Kay upright bass. Old Radio Information, Maintains an archive of transformer data sheets. It's a bit of work to figure out, but the wiring details for the UTC #O-2 mic transformer used in my design are given in UTC Terminal Arrangements.